A desk is extremely helpful for proper recording in the studio. Choosing a recording studio desk is just like choosing other recording gear and equipment – it is highly important. The desk is the place where most of the gears are being placed. It is simply a thing that offers flawless and hassle-free recording sessions. Thus, it is necessary to have a desk that contains everything you need on a budget. Without materials, no recording desk would be built. However, choose those sturdy, sleek yet inexpensive materials such as pine that provide the strength you need to support heavy equipment. Take a look as well on those two-by-sixes and plywood to get a great looking desk for a fairly low cost. Compare the price of the materials and choose those types that meet your expectation and requirements but most importantly, your budget. Quality is nearly a second to price. The good thing is, not all cheap materials are poor when it comes to quality. You would temp to go for those most expensive recording desks to ensure the quality but then, it is not always the case. Even those highly expensive materials will not bring you in the long run if they are not being built well and they are being handled carelessly. Actually, quality does not always depend on price. A recording studio desk is not made for your closets, shoes or anything; it is made for your studio recording. This is the reason why the design must be a foil for to its purpose. Don’t forget to take into consideration the overall desk design. It is ideal that your studio’s theme is relevant to the rest of your recording equipment. Determine the measurement of the desk. The size of it should fit in the corner of your room. Any studio desk should have a shelf that bumps up both of your studio monitors and computer monitors. Elevating your studio monitors is important in order to get the best sound. Your speakers should always be at the ear level. A desk that consists of an upper shelf and a desktop is much more important. 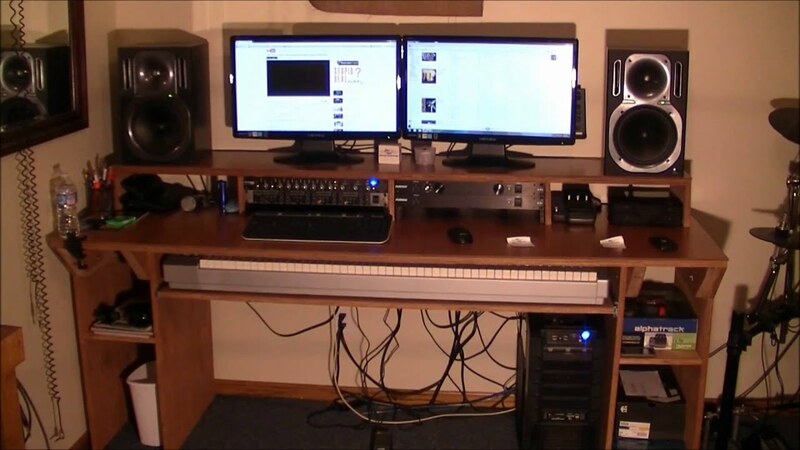 It is also good to put some small rooms probably on each side or on a lower shelf for more organized recording desk. The number of shelf and room on a desk depend on your desired design and the things you want to put there in. Studio desks are designed to hold your gears and equipment. To be able to maintain untidiness in the workplace, don’t leave all your hardware on your desk. A desk is just a desk. It can help organize but too much will do the opposite. Buying a recording studio desk usually cost $2000 upwards. Seems pocket-breaking isn’t? But if you take time and effort to build your own, it will most likely cost for only $100 or much less. The idea of building your own is more attractive and worthy than purchasing ready-made ones. It saves money plus it promotes fun. The best part of all this is: you do not have to be a talented carpentry with excellent wood working skills. You just have to spend some of your time and express your imaginative ideas while enjoying the process. The best home studio recording desk does not have to be expensive. You can possibly have the incredibly amazing desk on a budget.